The rains are less reliable. Sudden heat waves create challenging conditions for crops. Poor harvests result not only in debt, but also in malnutrition for smallholder farmers. Farming in India is not an attractive career option. Many Indian farmers are turning their backs on the life altogether. The pull of the city, with the promise of better work and a better income, is drawing huge numbers of rural Indians away from the land. Women in India have always been involved in farming, typically doing work between the traditionally ‘male jobs’ of sowing and harvesting, such as weeding and applying fertiliser. But they usually work land that belongs to their husbands’ families, and when households become more impoverished they have to work harder yet still earn less than the men. 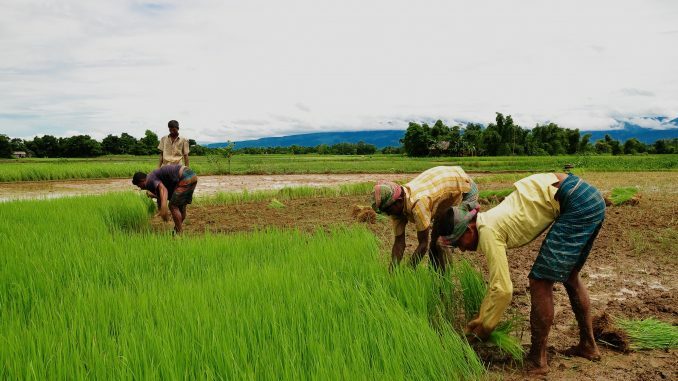 “It’s becoming difficult to get a reliable income from agriculture in many parts of the Indian subcontinent,” says Dr Shailaja Fennell, from the Centre of Development Studies. “It’s quite common for the majority of younger family members to go to a town to look for work. In the last decade in regions like the Punjab – which benefited from the Green Revolution – even many of the young women are leaving the land, to study at school and college. The record grain outputs of India’s ‘Green Revolution’ in the 1970s and 1980s established the country as one of the world’s largest agricultural producers, sustaining its booming population and boosting its economy. But the level of success varied from region to region, and the continued overuse of water, fertilisers and pesticides, together with post-harvest crop losses, has put increasing pressure on natural resources. India’s rapid population growth continues, and the UN estimates it will surpass China by 2022 to become the most populous country in the world. And more people means more mouths to feed. Fennell is a co-investigator of TIGR2ESS: a new, large-scale, multi-partner project that has just been awarded £6.9m funding from the Global Challenges Research Fund (GCRF) by Research Councils UK to address this complex web of issues. Drawing together a formidable network of partners from research, industry, government and NGOs in the UK and India, the project aims to define the requirements for a second, more sustainable Green Revolution, and to deliver this through a suite of research programmes, training workshops and educational activities. The funding forms part of the UK government’s Official Development Assistance commitment, and partners from both countries will work together, with over 22 new researchers funded in both the UK and India. The empowerment of women will be a key theme of this multifaceted project. Providing India’s women with the skills and knowledge to contribute to improved food security for their country, and better nutrition for their families, will take various approaches. The UK–Indian partnership will set up ‘nutrition kitchens’ in Indian villages alongside existing health centres to run monthly cooking classes and provide nutrition-relevant education. And in the field, workshops will educate female farmers to help them improve their farming practices. TIGR2ESS will include fundamental research addressing crop productivity and water use in India, and will identify appropriate crops and farming practices for different climatic regions. It also includes a capacity-building programme of researcher exchanges between the UK and India to ensure skills development and build expertise for the longterm. And it will draw on expertise at Cambridge’s Centre for Science and Policy with the aim of bringing about policy change in India, to ensure that it is not just the men who receive farming support. “Recognising that an increasing number of India’s smallholder farmers are women, we need to ensure that state resources and services, and knowledge, are equally accessible to them,” says Dr V. Selvam, Executive Director of the M. S. Swaminathan Research Foundation in Chennai, one of the India-based project partners. While TIGR2ESS focuses on improving India’s food production, a £340m EU Innovation programme involving Cambridge aims to put Europe at the centre of a global revolution in food innovation and production. Around 795 million people worldwide don’t have access to enough food to meet their minimum daily energy requirements, while at least two billion consume too many calories but don’t get the nutrients they need. Both the hungry and the overweight suffer the health consequences of poor diet. And while our increasing population is creating a growing demand for food, 25% of what we already produce is going to waste. Add to this the changing climate affecting crop growing conditions, rapid urbanisation and the increasing demand for resource-intensive foods like meat – the net result is a food system that’s increasingly under pressure. Cambridge is one of several European universities and companies that last year won access to a £340m EU Innovation programme to change the way we eat, grow and distribute food. The project, funded by the European Institute of Innovation and Technology (EIT) and called EIT Food, has ambitious aims to halve the amount of food waste in Europe within a decade, and to reduce ill health caused by diet by 2030. “Sustainability is a top-level agenda which is engaging both global multinational food producers and academics,” says Professor Howard Griffiths, who helped to lead Cambridge’s involvement in EIT Food, a consortium of 55 partners from leading European businesses, research centres and universities across 13 countries.